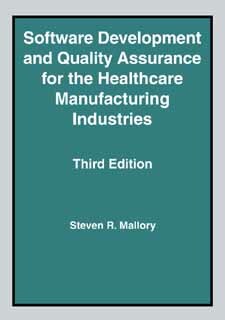 Completely revised and updated, this book is a practical guide for anyone involved in all levels of the development and quality assurance of software programs for healthcare productsparticularly in the medical device and equipment manufacturing industries. From high-level strategies and mechanics to detailed flow charts, tables, and sample forms, the text helps assure that all requisite phases of development and testing have been considered and implemented as readers develop a complete, integrated, cohesive, and interrelated software quality assurance program. Readers will learn how to design, implement, and manage the software development effort, as well as how to audit the program. How Did A Nice Discipline Like Quality Bet Mixed Up With Software Engineering?